Hello Everyone! I am very excited that today IndieWritersReview is host to the very talented, young Country Artist Josey Milner as part of Maverick Promotions virtual tour! Growing up on a small farm in Missouri, one might say that country is Josey’s pedigree. At age 7, she began barrel racing at local rodeos, making the rodeo arena her first stage. She started singing the National Anthem at her youth rodeos, eventually graduating to performances at PRCA rodeos across Missouri and Kansas, including the American Royal in Kansas City. These anthem performances led to the decision for Josey to hang up her spurs and follow her dreams of country music fame. More recently, Josey has also opened standing room only shows for American Idol, Scotty McCreery, Chris Cagle, and Jon Wolfe. She has performed at CMA Fest and the Hard Rock Café in Nashville, The Teddy Bear Festival for children’s charities, and the Nascar Kobalt 400 in Las Vegas, for Welcome Home Troops. In November 2013, she performed for the International Music and Entertainment Association Awards, for which she was nominated in three categories: Best Country Female, Best Country Single, and Country Entertainer of the Year. She was also nominated for Shooting Star at the Nashville Universe Awards and Best Female and Artist of the Year at the Midwest Music Awards. With international airplay, charting, live performances and awards, and even a Facebook game using her image (A Better World) and a celebrity endorsement with Piaseci MD skincare, Josey is poised for world-wide stardom. One thing is for certain, wherever her music may take her, she will always remain the small-town girl with the rodeo spurs still hanging on her wall. 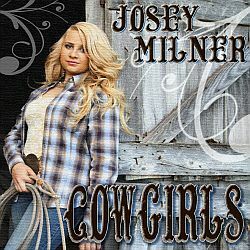 For more information on Josey Milner, please visit http://www.joseymilnermusic.com. This single is about a “country” girl who has had a long week and now that it is Friday, there isn’t anything that can keep her from going out and cutting loose. The fiddle has a strong lead in regards to the instruments,but Josey shines the brightest in every aspect. It is always great to get new music from this young lady. She has everything it takes to make it big in Nashville and hopefully they will take notice soon. Maverick Promotions Video Chat with Country Artist and Anti-Bullying Spokesperson Josey Milner! IndieWritersReview’s Music Monday! 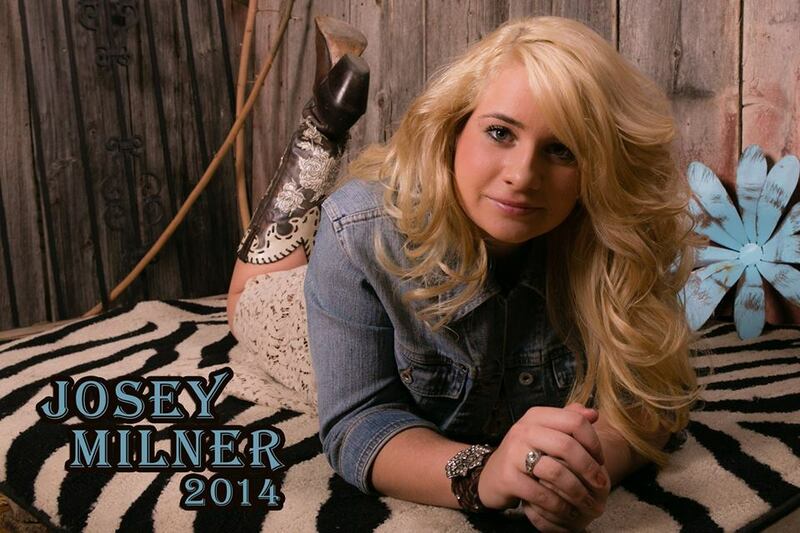 Spotlights Country Artist Josey Milner! Happy Monday All! Well, guys if it’s Monday then it’s music! Today I would like to throw the spotlight on Country Music Artist and Anti-Bullying Spokesperson Josey Milner! Josey is also launching her Maverick Promotions Tour today…so check out tomorrow’s feature of Maverick’s #video Q&A with the talented young artist! 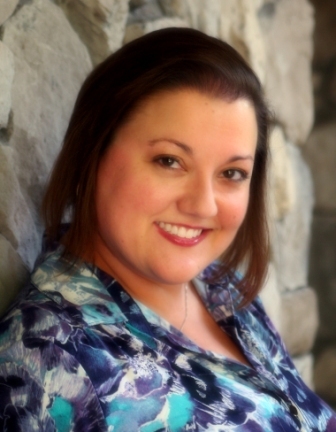 Kelli Sue Landon is a mystery novelist and short story author. 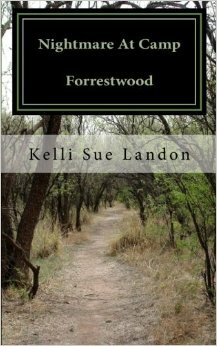 Her novels include Sudden Moves, Nightmare At Camp Forrestwood, Summer Shack: A Killer Vacation, and Stranded in Time. She is from Peoria, IL and works for the United States Postal Service. More information is on her website at www.kellisuelandon.com. Holly Jenson is a senior at Madison High School. She’s also a new student and nervous about fitting in. The senior class camping trip is coming up and with her new friend, Mindy, and her crush, Matt going, she hopes to have a good time. The school holds this camping trip every year to teach students about surviving without modern technology. Cell phones, computers, Ipods, and any other electronic devices are not allowed. At first, Holly fears that the trip will be a disaster with the popular kids being forced to share their cabins and interact with ones who they’ve bullied. But, then things get worse when the phones stop working and people start to disappear one by one. Holly, along with Mindy and Matt, start to realize that a killer is among the group. They have spooky campfire stories over roasted marshmallows and hiking trips when students start to disappear. Everyone is ordered to stay in their cabins by the teachers who look after them, but then they go missing too. Holly, along with Matt and Mindy, hatch a plan to go along with the Saturday Night dance which was planned from the beginning, for the students to attend on their last night there. If they are all in the same place, they feel that the killer would be easy to catch. But, things don’t go as planned and Holly figures out who the killer is before it’s revealed. The other students doubt her, but could she be right? As they try to hang on to their last breath, they do their best to take the killer down. That is, if they live long enough. Fri. July 25th 12:30pmcst/1:30pmest Ten Minute Twitter View chat w/ Host Michelle Cornwell-Jordan. Pls follow hash tag #MPTour. Oh my goodness! Where do I begin?! I believe this is one of the best Raine Thomas books I’ve read so far and that’s saying something because I am a huge fan of Ms. Thomas’s books and loved them all! There is simply SO much… it was action packed from beginning to end! But I will attempt to place my thoughts in order! Lol. 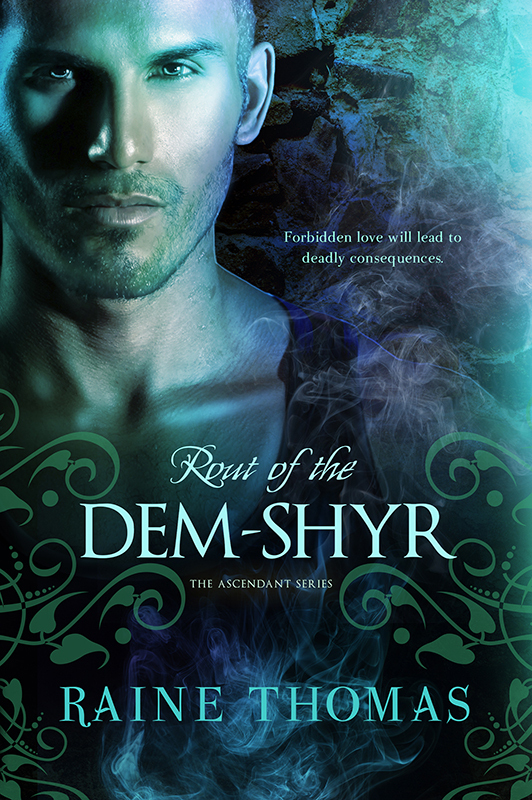 Rout of the Dem-Shyr (Ascendant#2) follows the story of Ascendant KyrVawn and her personal bodyguard and secret lover, Dem-Shyr TaeDane. Kyr is attempting to find her place in her home again and also adjust to her new role. But at the same time she cannot deny that she has changed while obtaining her life lessons on earth. Also she cannot deny her feelings for TaeDane. She hates having to hide her feelings, but the atmosphere is soaked with danger as an old enemy, Vycor, is still attempting to set traps for the couple. Plus her parents the Guardians, are proving less loving than she remembered, in fact Kyr soon discovers her mother Shaya’s jealousy towards her and that the woman would stop at nothing to get what she wants, removing anything in her path including her daughter if necessary! Plus with her father’s apathy, she realizes that TaeDane is her only family. But the laws of their society will not accept it, but as the story unfolds Kyr, TaeDane as well as those helping the pair, discover that their enemy’s plans goes far deeper than just thwarting the lovers! Soon all is unveiled and the treachery that is unearthed with mother against daughter and a lover destroying the one he loves…it had my mind spinning! I was on the edge of my seat and the thought The Game Of Thrones had nothing on this!! Freaking awesome guys! Plus as an added surprise (I don’t wish to give away spoilers) but one of our characters has a visit to the Dark Lands…and I know this is strange, but I thought the Dark Lands was so cool! Lol. Now in the story, the Dark Lands were the place where the worst of the worst was sent…murderers that were considered Outcasts…it is a land that reflects a failed society, desolate air poisoned. But the way it’s described by the author… there seems to be a terrible beauty in it, its rose colored sky and the pastel colorings of pink, blue etc. Plus with the environment which is toxic the inhabitants are required to wear air tanks, goggles and they have the coolest clothes yes…there is definitely a Steam Punk mark on the Dark Lands! The groups of the Marauders, Peace Keepers, Harvesters and Tinkers interest me and I wish to learn more of this place…I know crazy, the worse place mentioned in the book fascinates me! Lol. Hello Everyone! It’s Monday so that means Music! :O) Today I want to throw the spotlight on a Self-Produced band called Abney Park! I am so excited about discovering this group…I am developing a love for the SteamPunk genre, and this band is one of the mainstays for this genre in music:) They have their hands in not just music, but video games, books and more! Please check them out! Info taken from Abney Park’s website and Wikipedia! Abney Park is a steampunk band based in Seattle that mixes elements of industrial dance, world music, and steampunk-influenced lyrics in their work. Their name comes from Abney Park Cemetery in London (UK). Formerly a goth band, Abney Park has transformed their look and sound and has been called the “quintessential” representatives of steampunk culture. Abney Park was formed by Robert Brown in 1997. They released their first full-length album Abney Park in 1998, and in 1999 they released Return to the Fire. Their third album “Cemetery Number 1” drew from their first two albums as well as introducing several new songs. In the early years of Abney Park, the band featured a gothic musical and visual style, which culminated with their 2002 release From Dreams Or Angels. Their songs “The Change Cage”, “Black Day” and “No Life” reached number one on the Industrial, Darkwave and Black Metal music charts, respectively. In 2005, the band released Taxidermy, which is a collection of new versions of songs from past albums, three live tracks and two covers. In 2006, the release of the album The Death of Tragedy marked the beginning of a major change for the band, as their music departed from a goth/pagan sound to a more world music/fusion one. After this release, their line-up changed as well, with the departure of Traci Nemeth, Krysztof Nemeth and Robert Hazelton, replaced by Magdalene Veen (Eliza Gauger using a pseudonym), Jean-Paul Mayden and Nathaniel Johnstone. Shortly thereafter, Jean-Paul departed the band to be replaced by Daniel C.
In early 2005, Abney Park transformed themselves from a largely goth industrial band into a steampunk band. As part of that transformation, Abney Park invented fictional identities of themselves. Since steampunk is largely derived from science fiction and fantasy literature, the band also created a fictional backstory to explain the shake-up in membership and who they were now, and to set a stage for their new music. According to that story, the band’s plane collided with a time-travelling dirigible called the Ophelia—said to have been created by a Dr. Leguminous Calgori (presumably a reference to the 1920 silent film, The Cabinet of Dr. Caligari)—in a freak storm. The band commandeered the vessel, deciding to become airship pirates, and formed a new band from the surviving members of the crash. Much of their music since that time has been based around this fictional backstory. In the spring of 2008, Magdalene Veen left the band and was replaced by Finn Von Claret. That year, they released Lost Horizons, their first steampunk-themed album. Finn retired in the summer of 2009 to form Imaginary Daughter. Jody Ellen joined the band later that year and played her first show at Dragon*Con 2009. Also in 2009, the band released Æther Shanties, their tenth album. Nathaniel Johnstone hinted in March 2010 that they were working on songs for their next album, though no names were forthcoming. A recording of a live performance of one of them (later confirmed to be the title track, “The End Of Days”) can be found here. The End Of Days, their seventh studio album, was released on October 15, 2010. In late 2011, Nathaniel Johnstone left the band, to be replaced by Titus Munteanu. On April 11, 2014, Jody Ellen said on her Facebook page that she left the band to carry on her solo career. On June 20, 2014, Daniel Cederman made a statement on his Facebook page that he was leaving the band for a position as Dean of Military Science at Hofstra in New York City, in order to pursue a PHD and spend more time with his daughter. Now sometimes called the “quintessential” steampunk band, Abney Park has been featured in major news media and interviewed by several genre magazines and websites, and has been highlighted on MTV and G4TV as primary examples of the steampunk musical scene. Their music has also appeared in several movie soundtracks, including Insomnis Amour, Goth, and Lord of the Vampires. The Abney Park song “Sleep Isabella” was used in a scene in the HBO series True Blood, Season 5 Episode 4. In August 2011, Cubicle 7 Entertainment released a role playing game based on the world of Abney Park’s backstory. Set in the post-apocalyptic world after their album, “The End Of Days” – a future world with a severely disrupted timeline – Airship Pirates features steampunk themes and Victorian-era style. Airship Pirates places players in command of their own steam-powered airships. There they will seek not only to pillage the skies, but to plunder history, possibly causing even greater disruption to the past. Meanwhile, the world below struggles in Victorian-style squalor under an oppressive government that maintains control through clockwork policemen. In December 2011, the RPG game won Diehard GameFAN’s “Best Core Rulebook of 2011” award. In 2012, a novel was released entitled “The Wrath of Fate: Book 1 of The Airship Pirate Chronicles”, by Robert Brown. Set in a post-apocalyptic steampunk future, the book is a companion to Abney Park’s music and RPG game, exploring Abney Park’s backstory and fictional setting in greater detail. A second novel in the series, “Retrograde”, is due to come out in 2013. Okay I have one word….MORE! The Donor was a tasty treat from Author Nikkie Rae, that I did not want to end. In fact, at the end I was startled (there wasn’t more!) my first thought was…”oh no she didn’t!” LOL I groaned in anxiety that the author cruelly left me as a reader hanging! But also thrilled because it really gets me excited for the second novella! But let me start from the beginning. The Donor is the first novella in a serial that follows the tale of Casey Williams and Jonah Black. We meet Casey who is basically in dire straits. She is an eighteen year old girl working a dead-end office job that she dislikes. In order to pay for a few semesters of college and to help financially her mother and father, who are at a loss to cover their normal bills, as well as her father’s hospital bills, she sticks with it. But she is not only dealing with her family’s troubles, Casey is ill as well, suffering from extreme headaches and nosebleeds. Her condition worsens by the day, but she does not seek care for herself knowing that her family cannot afford it. So when she hears two of her office mates, Emily, who hates her and Gina, who does not hate her as much… chatting about a website called MyTrueMatch, it appears to be a lifeline for her. After befriending the lesser of the two evils… Gina, she discovers it is a website accessible by invite only, that services provided are for a certain clientele with specific requests and desires. The clientele major base’s, main common element is that those who subscribed are very wealthy and will recompense well. Seeing this as a last ditch effort to help her family, Casey allows Gina to submit her picture and information, after days she receives an invite to the site. There she meets Jonah, who she realizes seems different to many of those on the website. He appears very honest about himself and she likes that he desires to get to know her first…but her only concern is that he does not send any images of himself, as if he is hiding something. But as things worsens at home, after a month of corresponding, Casey agrees to meet with Jonah and from that meeting everything changes! I believe Author Nikkie Rae did an excellent job with The Donor. She met the challenge of providing an interesting story-line that keeps readers on the edge of their seat with characters that the reader will care about. The fact that Ms. Rae was able to doso in such a short work is incredible! I enjoyed the story and was thoroughly upset when I realized that I would have to wait to find out what happens with Casey and Jonah! But each part appears to be released quickly, so my wait will not be too long with the second novella scheduled as an August release! Woot! The novella was well-written, the paced flowed…there was enough mystery to keep me invested in the story and wanting to know what’s next! I liked Casey,her strength and courage and I liked Jonah his gentleness and caring personality. But there is still that slight edge, not knowing what he actually has planned for Casey! I fully recommend The Donor by Author Nikki Rae! I was tagged by Author friend the fantabulous Denise Zaky to join in the fun… The rules are simple. Post the first sentence for the first 3 chapters! Racing For The Moon (SteamPunk Novella) teasers! Chapter 1: “They’re coming. Run, Ivee!” A lone voice broke through the silence of the evening shadows. Chapter 2: “Where. Have. You. Been. Ivee?” Bangs stood wide stanced with his arms crossed. Tall, with lean muscles that lined his body. He was one of the oldest of the Landers, at twenty one. Chapter 3: “Bangs on your case again?” Celia scrambled onto the makeshift counter that Ivee had created out of large sturdy rocks and a plank of wood.